Whether you're a casual personal user or a heavy weight business user of Facebook, in wake of the recent Cambridge Analytica scandal where they used over 50 million accounts personal information in ways the users didn't know about to influence political campaigns. More namely the Russian elections. Apparently it looks like Facebook turned a blind eye to the surreptitious use of people's personal information in exchange for cash. As if FB don't make enough money right? I guess it's an embarrassing thing for Mark Zuckerberg after it really exposes just how real it is and how much that big conglomerates really do sell your personal information to 3rd parties for cash regardless to it might effect you or your country. Not to get political but it's all business and a loss of for Facebook as many more people than before are actively not using Facebook now and switching indefinitely to other platforms like Instagram and Whatsapp as alternative contact methods. Minus all the fake news and personal data harvesting let alone targeted ads. That said, I see FB stepping up their commercial advertising campaigns for businesses and there's still a lot of opportunity for businesses, brands and people to reach and connect to their targeted audiences with FB. But I think that from now on it will be more businesses than personal users that use FB. Especially the younger crowd, millennials. My nan is still figuring FB out LOL! What do you think of the Facebook Cambridge Analytica thing? What do you think is the future of Facebook now after all of this? Found this funny meme to accompany this brain picker! In this modern age of consumerism and advertisement, information is the most precious commodity. Facebook and Google are both fantastically good yet absolutely terrifying at collecting data and using it to target advertisements at you. That being said, I don't know how long either are going to continue doing well. The thing is that more and more people are becoming aware of just how much of their data is being collected and sold. Facebook lost millions of users in 2017, even before this whole privacy scandal, so it was going downhill just by the natural order. Not as many people are using Google as well, and are turning to more anonymous search engines such as DuckDuckGo. I feel that both companies will adapt and improvise, and ultimately survive. However, it is quite possible that they will never make as much profit as they had in their prime. I think the real question is how many of those 2 billion accounts are actually active users. For example, I still have an account in case I need to ever contact friends/family for whatever reason, but I don’t have any friends, photos, status updates, or anything. I'm basically inactive on Facebook, save for having an account on reserve. I know plenty of other people that use it that way as well. They have an account just in case something comes up, but I never see them on Messenger or posting any updates on their timeline. It’s like how some YouTube channels can have millions of subscribers but only a couple thousand views on every video, since not all of those subscribers are active viewers. It's ridiculous that they make us believe that we are in control of what we post on the social media, while they go behind us to leak information that are really personal to us. This is going to make many of us not to put trust in them anymore which is quite a bad situation for them as long as I am concerned. Thats the problem with us. basically we people love to have free things. in return, we dont notice that what precious thing we are loosing!!! The information--- its the modern tools of distraction! 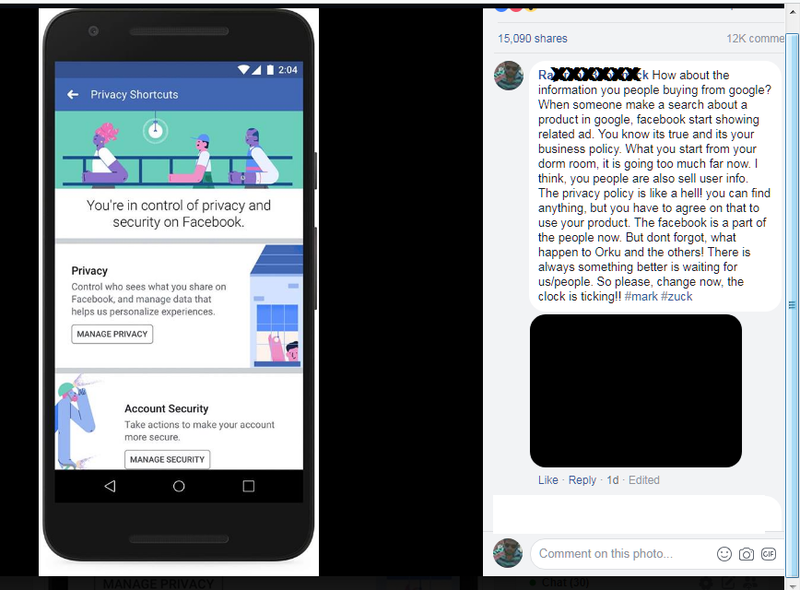 I think many people didn't trusted facebook due to their policies. Now people are just using it for keeping in touch before some other network comes along. Facebook asks a lot of personal questions, like what you eat, where do you go, what you want to be etc. Too much data collection. So they deserve to be deserted and removed. I hope new social network comes along. Yeah you're right, and even some memories for the past or things you posted on that site, they'll bring it back, for you to remember, almost all of the details about our life. I think if ever there are another network or social media sites to come similar to Facebook, they will do the same things. Yep such data collection is known as sentiment analysis. And it forces you to buy things you don't need. And also makes you feel that your life is boring and not happening. Because you see reel of other people enjoying. Facebook has damaged entire generation of people. But it's really hard to limit that situation. But basically, this Facebook is just a normal site, It's also up to the users how to become responsible to their account. The only problem about the Facebook is their security. How come that they asking for some personal information with that kind of security. No problem lies with entire facebook itself. For example if I am stalking you. I am going to ask you questions like where you are right now what are you eating when do you go to sleep etc etc. so you can see asking such questions and selling this data to other companies is what facebook does. Yeah, you're right, and actually this issue from Facebook now is in our country Philippines. I heard from news that, we also affected from this situation. It's really easy for the owners to get a lot of information from their subscribers, and it's easy also for them to denies that and blame the hackers. People all over the world are affected. And people should move to other social media sites. I think as of now not other social media sites working around. So they are kind of stuck with the facebook. Yeah, They might be working right now to have a new social media sites. I wonder if the Friendster before will rise up and start again. Well, that's funny thing to remember the old and I think the first social media site. I guess there needs to be new social media that does not ask too many personal questions. And that's one of the things that people need to understand. And not all the people are going to stay on facebook. It is lot better that way. I don't know. They ask for a lot more data than they need to know. ON the news here one of the correspondents found out everyhting FB knew about here by going to the dashboard. She printed out pages, and pages of material. It was a little frightening. If I ask you question like where do you live, where do you go to get cash removed, where do you work. Do you think such data in the hands of say mafia can be used for safe reasons? Many people are going to get scrutinized and who knows they may have extortion or be used for other reasons. So facebook asking too much questions is bad. While it will definitely affect Facebook's profitability at the moment, as the #deletefacebook movement gains steam especially in US, more people will get carried away by this and delete facebook in the near future. However, as of right now, there simply is no better alternative to Facebook since the other popular social media like Twitter or Instagram have their own niche and has nowhere near the number of features that Facebook currently has. In addition, almost all social media use personal information of their users for other means. Therefore, until a strong competitor to Facebook arises, Facebook will eventually bounce back from this in the future. Well I think people will not trust this Facebook anymore, and they will avoid to post some personal information or business related on their social media account, and it's gonna be a normal platform to communicate to friends and relatives. I think if there's some alternative site most similar to Facebook, a new site actually. they will leave this Facebook. Most people are not that happy with facebook anymore anyway. It is too much of the same people posting the same content. It gets really old. I am not too happy about it. It is good thing that people are becoming disillusioned because it will hopefully lead to changes. But I think this problem of Facebook is just related to politics, and propaganda of the loser politician or party and not because of the subscribers or members of Facebook. Well what I can see right now is, the people behind this controversy is successful by destroying the credibility of Facebook and get the sympathy of the members. ~ What do you think of the Facebook Cambridge Analytica thing? I don't think much about it. Seems like a lot of “brew ha ha” that will die down whenever the “brewers” decide that their “brew” is not being drunk by enough of the masses to get everybody “pliable”. You asked me what did “I THINK”. LOL. ~ What do you think is the future of Facebook now after all of this? I think it has a future. But I'm no prophet. Only time will tell. Until another social media of different owner takes market, I don't think facebook would do much damage. I guess they are going to stay dominant until the last person exits. I am sure there are some of the people who are quitting but not all. The most recent report in USA Today (Oct 2, 2018) tells of another data breach for the social media giant and this breach is the largest hack in the company's history. Will Facebook survive? Of course they will! They already survived Cambridge Analytica. Yes if they can survive cambridge analytica, they are going to survive this too. I am sure that people would surely understand they are not the one in the power. And that's a bad thing for those who have lot of data online. So it may surely take time for the social media to catch up to replace the facebook. The Facebook data breach may be scandalous but I heard an even more shocking news report today on the Bloomberg Channel about China planting chips into the computer equipment of US corporations like Apple and Amazon. This report makes the report about Facebook look like an innocent kid who accidentally broke a cookie jar. It's hard to believe the intentions of China are honorable. China was always like that. So I am not surprised. This is the reason why many companies don't do production of electronics from the china. And instead they are working with other companies overseas. But lot of such production can't be avoided for sure. I think all major online companies with heavy traffic like Facebook, Google and many others who asks permission to control our smartphones and computers whenever we are signing up, are putting all data gathered from their users into good use by selling it and getting tons of money in return. Nobody takes your data more than facebook. They ask you lot of questions. So that is more data. Like where you are right now. And what you do and what you eat. What you purchased. all that data is being sold to companies. Well it looks like we are willing victims in that situation. We provide that information without asking why. We don't know that, and it's also looks like we were under surveillance for many years. It's really sad that such a situation is arising out of facebook. I mean for goodness sake, Facebook is the online network that has got the largest number of users and those that are on it for business purposes. So, I feel bad to read that the personal information we share ain't safe anymore for us that are on the platform. It is quite a bad situation as long as I am concerned. I don't think this scandal will matter much for most of the facebook users because facebook already has addicts. facebook is the biggest social media site and online entrepreneurs and business will continue to benefit from facebook marketing. The data breach is an issue that will soon pass. People will eventually forget this. The scandal has taught a lesson. You should never share "too much" information online. I have to agree. That scandal has not affected people and their business in any way. So this time too I don't think there is going to be any issue. Most likely things may change in terms of how facebook responds. But from what I know facebook stays strong with more money coming to them. I think that is the downside of using a free platform such as Facebook, we really believe that our information is safe and cannot be captured by any third parties which really turns out to be a fake news. I really believe that there is no assurance that our account or information might not be hacked or shared to other people because of the modern technologies that we are facing now. Nothing is really impossible now for people who are desperate enough to make some money out of the expense of the other people. Interesting question. I think it's bleak especially because people are worried about how their personal data has been used. The way Facebook reacted to the scandal was not correct in my opinion. They kept quite for too long and left the media to control the narrative. They only came out to apologize after Facebook's share's lost their value on the stock market. This in my opinion is not the sign of a repentant person. This will hurt Facebook. I don't think Facebook will be gone in the near future. Facebook has been found to meddle with Philippine elections too. I just don't know how, but I don't really care because even before the stardom of the internet and the social media in my country, those who are in the position did abused their powers and still reign the government. So what's new? Now that this is getting global and the current leaders a being exposed, I hope that Mark Zuckerberg will own up to this embarrassment and change it. But that is a wishful thinking because money rules the world. So for me, with this latest expose, this will NOT stop Facebook and the people behind it but it WILL bring chaos to the world. That is just the sure thing I can see with this one. Sadly, this is a reality. Pardon me if my comment goes against the tide. My take on the negligence of Facebook regarding the illegal and unauthorized use of personal data of Facebook users is just an issue. Again, pardon my comment because I don’t think people will stop using Facebook in the wake of that scandalous issue of misuse of information. In other words, even if there is a series of such issues, Facebook will still continue to be patronized. That’s how cynical the people of the universe are. The 'scandal' got me thinking if I have actually shared too much of my personal details on the digital world. The answer is no. I don't live off the offline community, I've never used Facebook as my therapy. I use a number of email addresses for different purposes and I have several mobile numbers for various reasons. I have three Facebook accounts. I think what happened was something that should be expected and that we owe it to ourselves to protect important or sensitive personal information. Facebook isn't the only party guilty of doing it. Even small ones like local telecommunications companies are sharing their clients' data to their marketing companies which, in turn, use the data to promote whatever product they want to push. Facebook may not be growing as fast as it did when it was just starting but it will still be the leading social media platform for many years to come, like it or not. Facebook like other platforms are just using our personal information including our preferences to target ads we see. I don't have a problem with that.